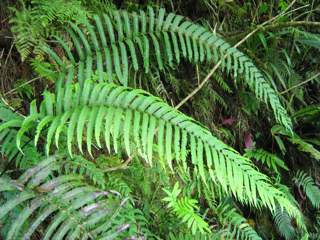 This list represents all pteridophyte species known to grow on Moorea. 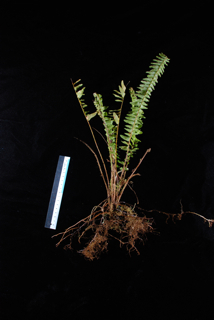 Most pictures are of living specimens taken in the field. 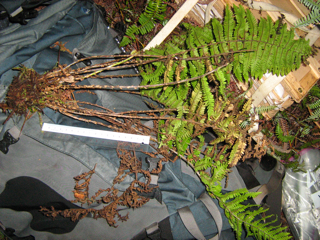 Herbarium specimens from the University and Jepson Herbaria at the University of California at Berkeley were used when field pictures were not available. Click on photos or on links to see larger pictures. 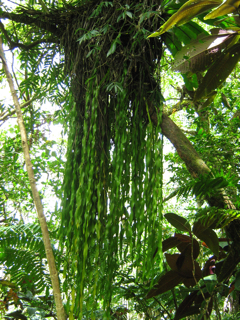 Description: Epiphytic at middle to high elevations; in rainforests, generally in high tree forks. 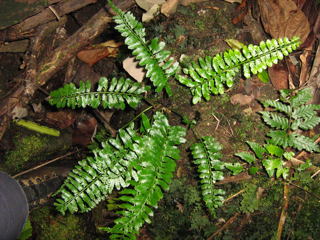 Notes: Differs from the less common Asplenium nidus by midrib rounded abaxially. 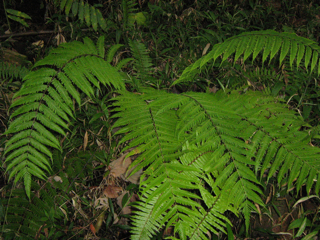 Description: Terrestrial at high elevations, in cloud forest. Description: Terrestrial at middle elevations. 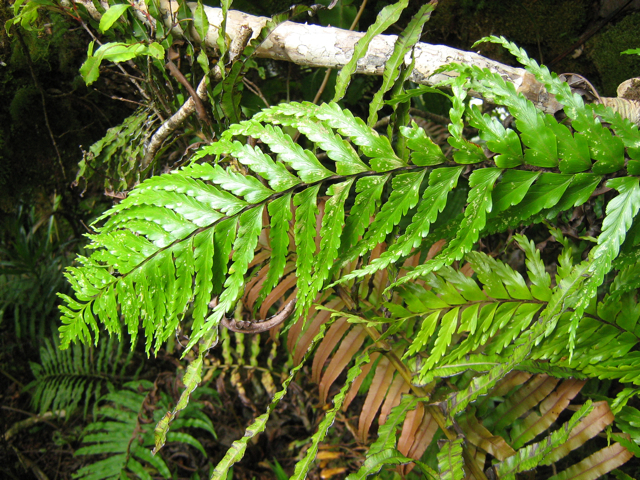 Notes: Often mistaken for A. australasicum, which is much more common on Moorea. 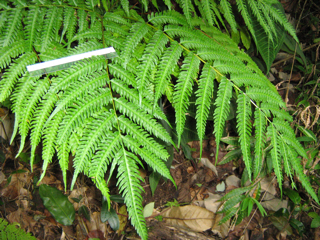 Differs from A. australasicum by flat midrib. 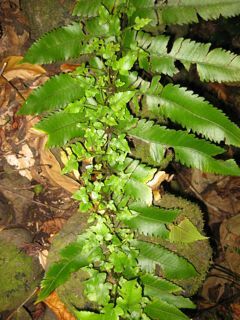 Description: Epiphytic or lithophytic, found in tree forks, at times with Asplenium australasicum, as well as on logs and rocks. Description: Lithophytic, rainforest, generally near creeks. Description: Terrestrial at middle elevations in rainforest. 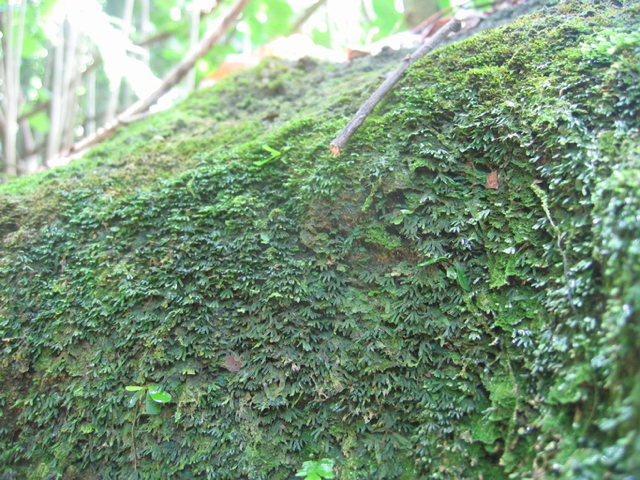 Description: Epipetric on damp rock faces in cloud forest. 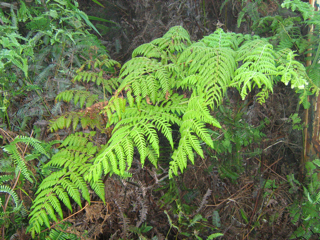 Morphologically similar to Deparia confluens but larger in overall size. 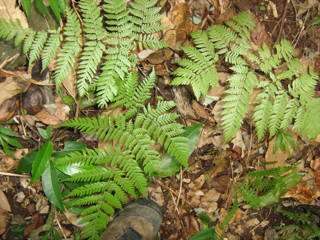 Description: Terrestrial in forest understory. 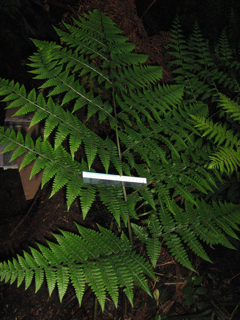 Description: Terrestrial in forest understory. Note numerous bulbets along rachis. Introduced. Description: Terrestrial at low to middle elevations, usually found in exposed, drier areas, often in colonies. 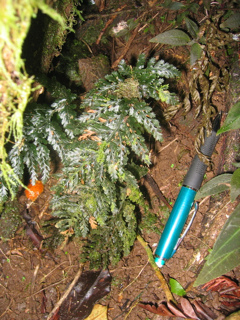 Description: Terrestrial at high elevations, in cloud forest. 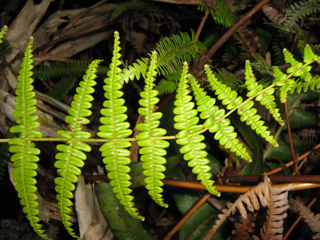 Lamina of fertile segments reduced, sterile segments expanded on the same frond. 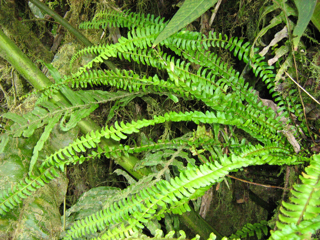 Description: Epiphytic at high elevations, in cloud forest. Young leaves bright red. Description: Terrestrial at middle elevations. Pinna gradually reduced towards base. 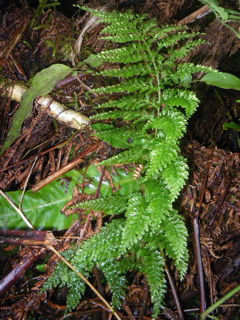 Description: Terrestrial at high elevations, in cloud forest. Young leaves bright red. 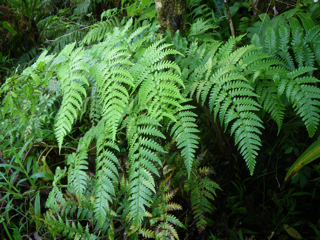 Description: Terrestrial at high elevations, tree fern to 10 meters, in rainforests and cloud forests; extirpated from some previously known localities on Moorea. 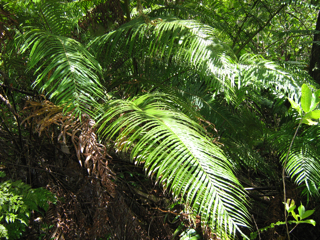 Description: Rare tree fern, terrestrial at high elevations. Scales concentrated on apex of growing bud tip. Description: Terrestrial at high elevations, in rainforests and cloud forests; extirpated from some previously known localities on Moorea. 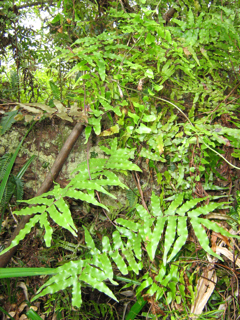 Description: Epiphytic or lithophytic at all elevations, usually in rainforests. 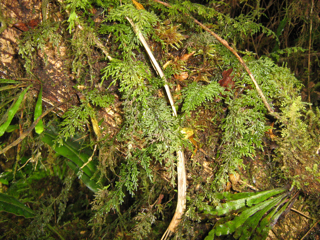 Description: Epiphytic at high elevations in cloud forest. 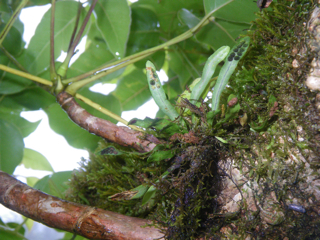 Description: Epiphytic or lithophytic, climbing on trees in rainforests. Description: Terrestrial at low to middle elevations, in forest understory near streams and/or in rocky areas. 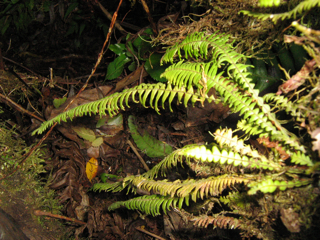 Description: Terrestrial at high elevation, in cloud forest. Description: Terrestrial, middle elevations in forest understory. Description: Terrestrial in forst understory. 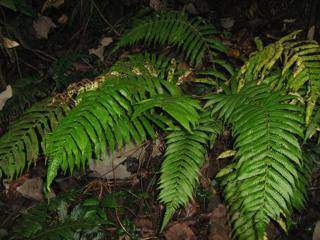 Description: Terrestrial, in moist areas in forest understory and among boulders. Description: Terrestrial, damp areas near streams in small valleys. 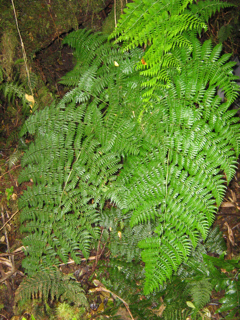 Description: Terrestrial, in forest understory. Description: Terrestrial at high elevations. 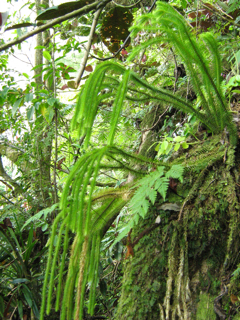 Description: Epiphytic at high elevations. 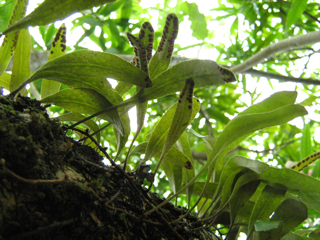 Note: Morphologically similar to Elaphoglossum samoense, but varies by thinner rhizomes covered with smaller scales and by serrulate petiolar scales that are flat and not erect. 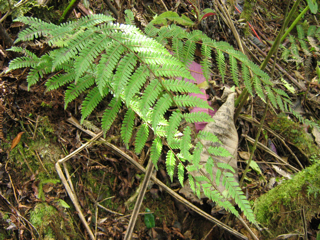 Note: Copeland called this E. gorgoneum, but that species is a synonym of the Hawaiian endemic E. aemulum (as indicated by D. Palmer and others). The most applicable name to Society Islands material is E. savaiense (type from Samoa). Reported for Moorea by Drake del Castillo (1893) as E. gorgoneum. 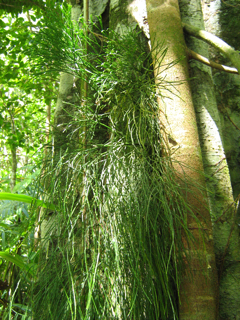 Description: Epiphytic at middle elevations. 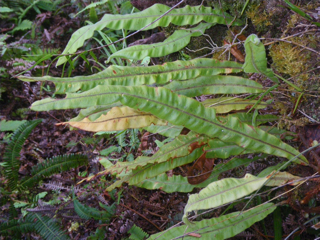 Note: Long thought to be a member of Davalliaceae, but molecular data shows it to be in Dryopteridaceae. Description: Terrestrial and climbing trees in forests. Description: Terrestrial and climbing trees, sometimes in open areas. Description: Terrestrial, thicket-forming, aggressive weed in dry, open, disturbed areas at all elevations; will completely colonize fire scars, growing in dense thickets up to 3 m tall., often in very hot, exposed ridges, where it forms the dominant ground cover; extensive use in decorating for festivals, also used medicinally by various Pacific cultures. 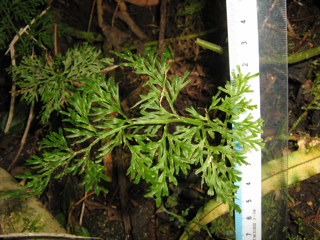 Description: Similar growth habit as Dicranopteris linearis var. linearis, but less common. 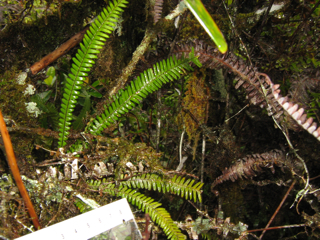 Description: Terrestrial at high elevations, in cloud forest, rare. Lamina is reduced to only a few cells wide on either side of vein. Note: Very similar in morphology to Southeast Asian Abrodictyum pluma; further studies needed to determine relationship between the two. 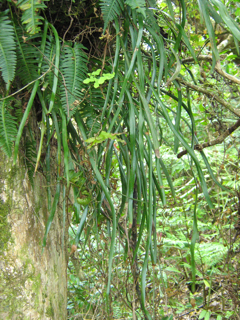 Description: Epiphytic at middle to high elevations. 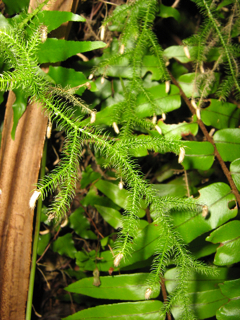 Grows exclusively on tree fern rhizomes. 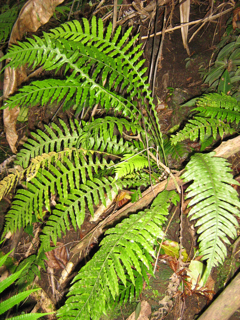 Description: Terrestrial at middle to high elevations in rainforest understory. 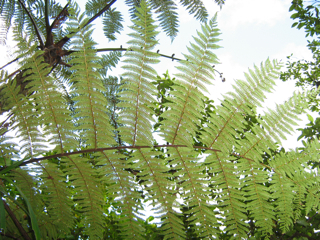 Fronds have tough, coriaceous texture. 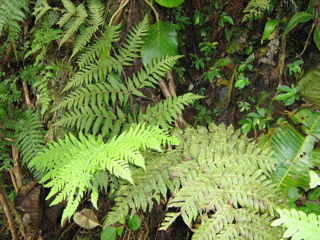 Description: Terrestrial at high elevations, in cloud forest. Often near streams. 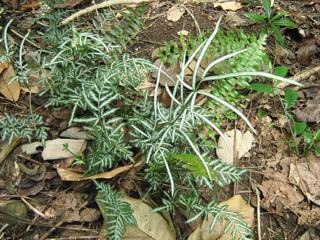 Description: Lithophytic or, less commonly, epiphytic in rainforest understory, sometimes growing with Crepidomanes humile. 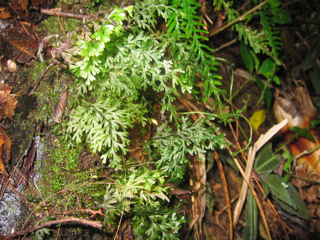 Description: Epiphytic or lithophytic in rainforest. 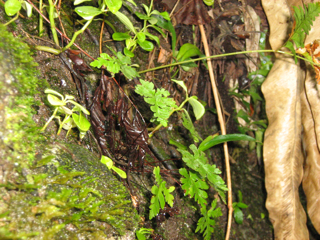 Description: Lithophytic in rainforest, rocks on streambanks. 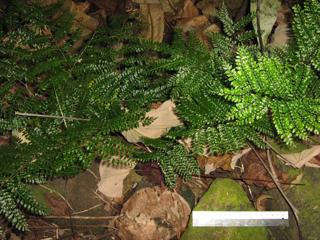 Resembles Crepdiomanes humile, but smaller (average frond 1 cm). 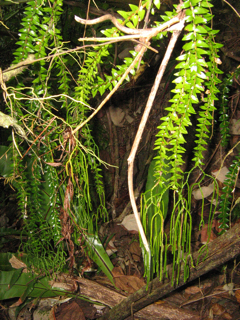 Description: Epiphytic at mid to high elevations. 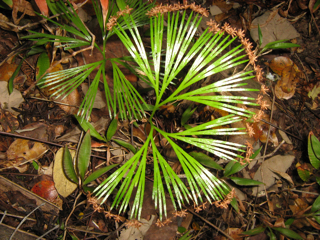 In some individuals, "proliferations" occur where a new frond is produced directly from the stipe or lamina of another. Note: Two morphotypes present on Moorea supported by molecular data. 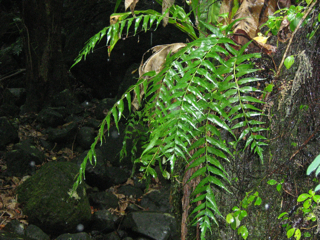 Description: Epiphytic or lithophytic on trees and wet rocks in rainforests; fronds peltate, closely appressed to substrate. 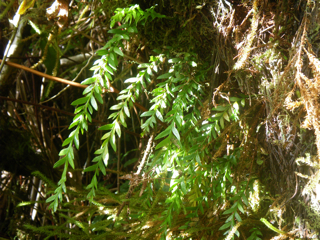 Description: Epiphyte at high elevations in cloud forest. Often occurs on well covered tree bases in very low light. 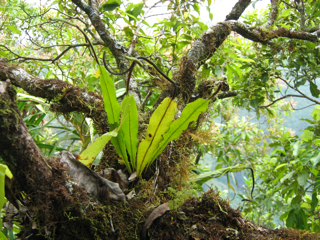 Description: Epiphytic at high elevations, in cloud forest. 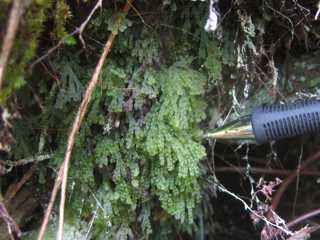 Note: Molecular data shows that this species is closely related to Hymenophyllum pallidum. 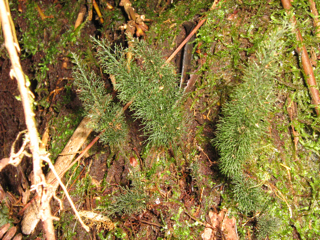 The two are very different in morphology except for the conspicuous yellow rhizome hairs. 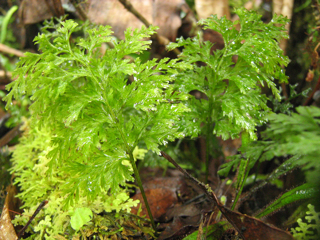 Notes: Specimens of H. javanicum and Hymenophyllum samoense form a continuous series of morphological forms. More study needed on this group. Notes: Involucres bent up relative to the lamina are characteristic of H. multifidum, but Moorean material is dimunitive in size and differs in other morphological details such as stipe wing. Further study needed. 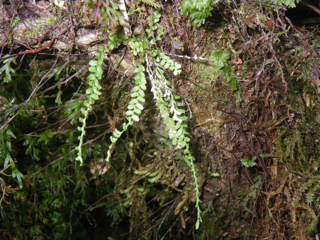 Description: Epiphytic at high elevations, in cloud forest. 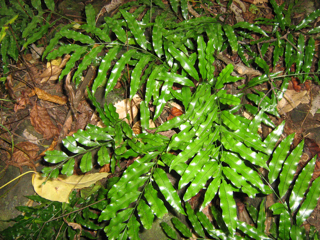 Frond surface has distinctive white sheen. 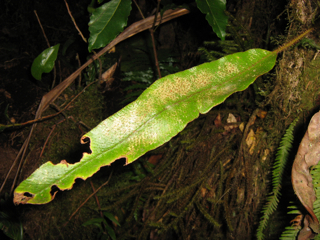 Description: Epiphytic at mid to high elevations, in cloud forest. 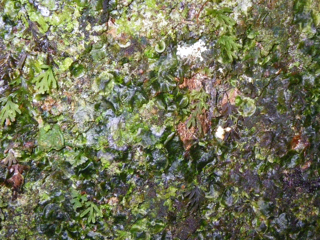 Notes: A cosmopolitan, polyphyletic species. Notes: Sometimes confused with Polyphlebium endlicherianum, but differs by lack of specialized sub-marginal cells. 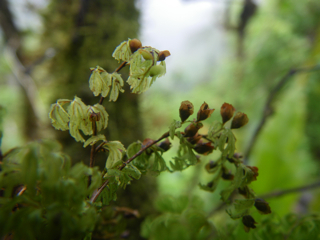 Description: Epipetric on moist rocks in low elevation cloud forest. Description: Terrestrial at middle to high elevations. 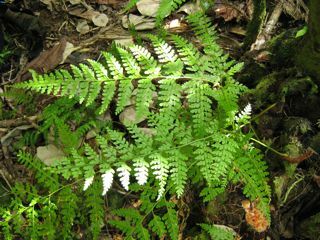 Description: Common fern of dry, disturbed sites. Description: Terrestrial and climbing trees in forest understory, rocky, shaded areas. Description: Terrestrial in open exposed areas. 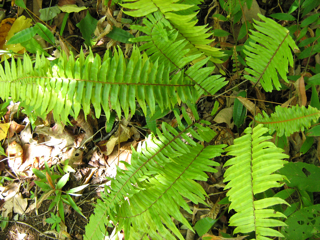 Notes: This species is the source of the "Boston Fern," the world's most popular indoor cultivated fern variety. 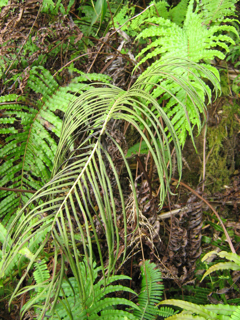 Description: Terrestrial or epiphytic, fronds to ca. 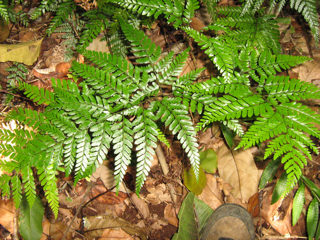 1 m, common at all elevations in forested areas. Description: Epiphytic, rarely lithophytic or terrestrial, pendant. 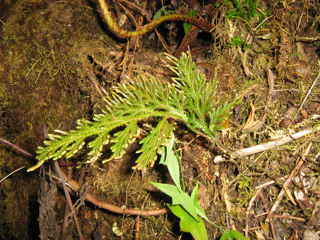 Description: Terrestrial at middle to high elevations, erect "clubmoss" with nodding strobili, found in open dry to moist areas, or on forest borders in understory. 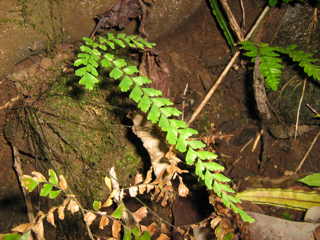 Description: Twining vine at middle to high elevations, in rainforests, frequently in disturbed sites. 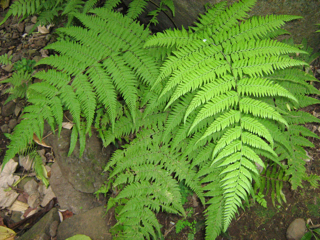 Description: Terrestrial at middle to high elevations, fronds 3 or 4 meters, widespread in damp areas near streams in valleys; larger than Ptisana, sporangia not completely fused into synangia, common. Description: Terrestrial at high elevations, in wet valleys; smaller than Angiopteris, sporangia fully fused into synangia, uncommon. 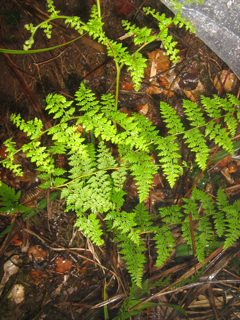 Description: Aquatic or semi-aquatic fern with clover-like leaves, in shallow water and very moist areas. 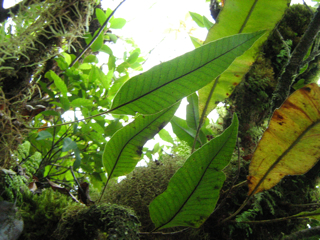 Description: Terrestrial at high elevations in cloud forest. 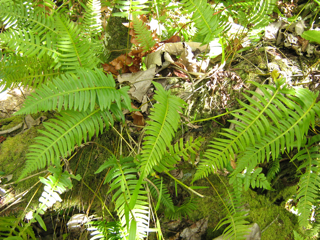 Common on ridges on Mt. Tohiea. 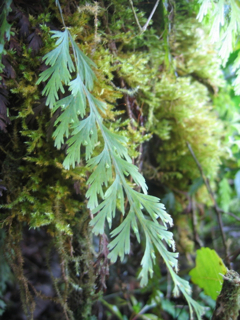 Description: Epiphytic or on fallen logs, at middle to high elevations epiphyte, pendant on forest trees, frequently growing with Asplenium australasicum. Description: Terrestrial at low elevations, in forest or open areas near water sources. Rare, possibly naturalized from cultivated plants. 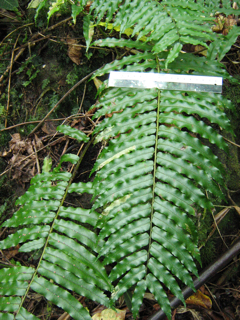 Notes: Formerly placed in Grammitis (see note for Grammitis marginelloides) but lacks black margins; the new combination with Archigrammitis is not yet published. 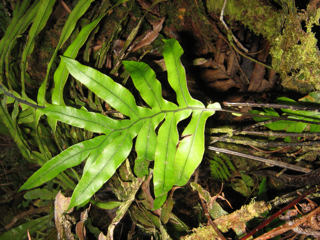 Description: Epiphyte or lithophyte in rainforests at middle to high elevations. 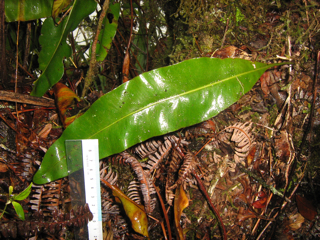 Description: Epiphyte at high elevations in cloud forest. 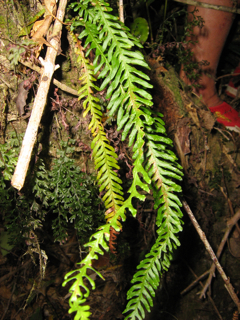 Notes: Calymmodon grantii is also reported from Tahiti, but differences between these two species are unclear. 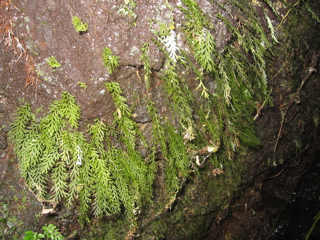 Description: Lithophytic or epiphytic in moist rainforests. 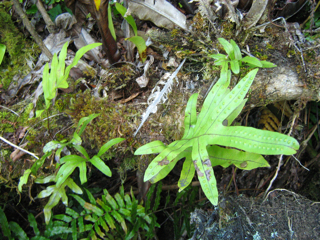 Notes: Dasygrammitis purpurascens is reported from Moorea, but current collections need to be checked against type material. Notes: Grammitis as currently circumscribed includes only those species with black margins, which form a monophyletic group. 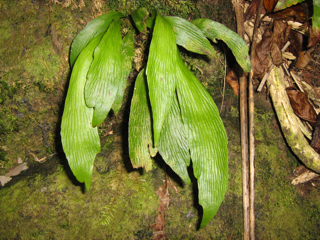 Description: Epiphytic or terrestrial in forest understory. 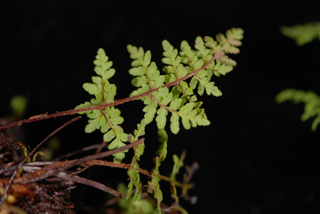 Notes: Commonly called Phymatosorus commutatus or Polypodium vitiense. 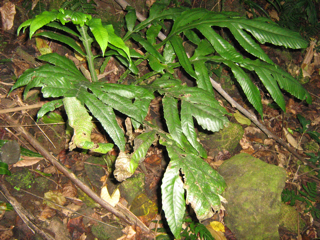 This species is commonly used medicinally in the Society Islands; Crushed leaves emit a pleasant aroma, reminiscent of cinnamon and coumarin. 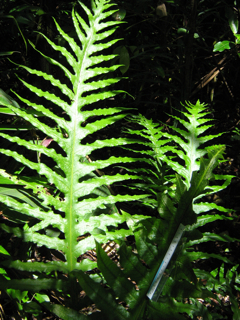 The more common Microsorum grossum is used even more extensively as a medicine. Description: Terrestrial or lithophytic, at all elevations in exposed areas or under light tree cover, also found on motu (reef islands). 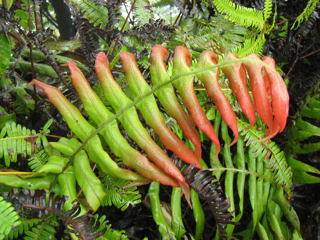 Notes: Commonly called Phymatosorus grossus, and all references to Phymatosorus scolopendria for the Society Islands are referable to this species. 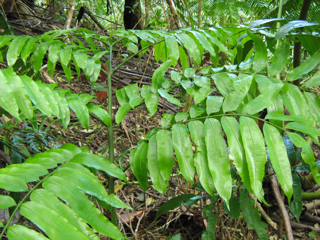 The most commonly used medicinal fern in the Society Islands, and likely in the entire Pacific. Description: Terrestrial or lithophytic at low elevations, coastal areas. Rare hybrid with irregular blades. 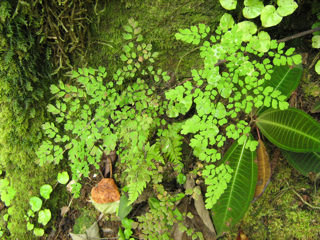 Description: Epiphytic or lithophytic in forest understory, fronds much larger than other similar Microsorum spp. 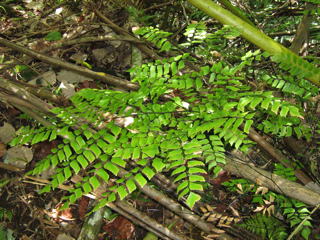 Synonyms: Microsorum nigrescens, Phymatosorus nigrescens, Phymatosorus membranifolium. 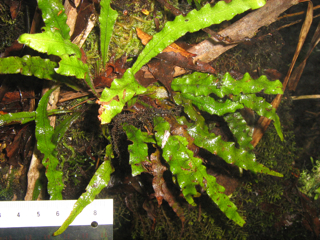 Description: Terrestrial, lithophytic, or rarely epiphytic at low elevations, in xeric coastal areas, frequently in sandy soil in coastal forest. 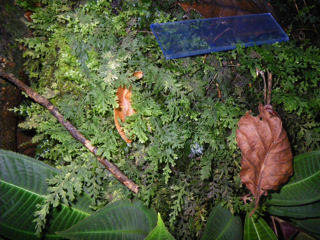 Description: Epiphytic in cloud forest. 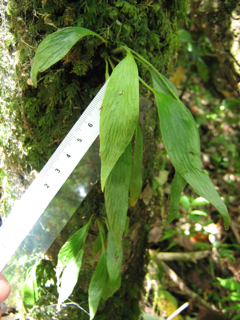 Description: Epiphytic at middle to high elevations. 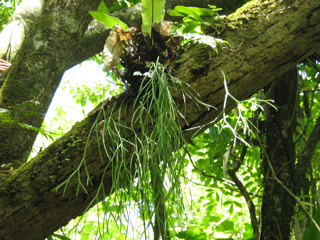 Description: Epiphytic in moist rainforests. 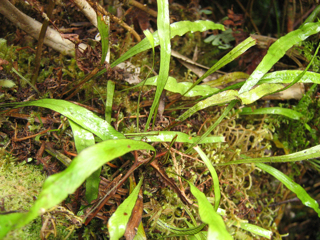 Description: Epiphytic or lithophytic at low to middle elevations. 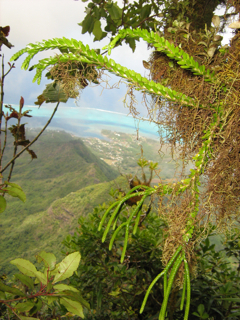 Description: Epiphytic at low to middle elevations, rare on Moorea. 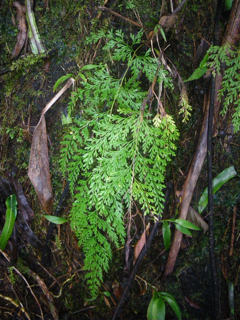 Description: Epiphytic or terrestrial, all elevations. 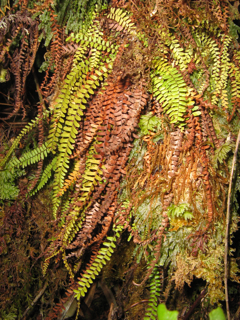 Description: Epiphytic at high elevations, nearly always on tree ferns. Rare on Moorea. 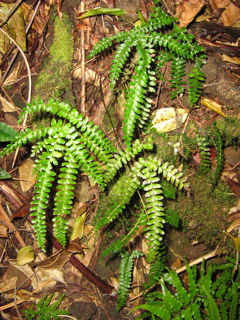 Notes: All collections identified as Tmesipteris tannensis for the Society and Marquesas Islands are referable to Tmesipteris gracilis. 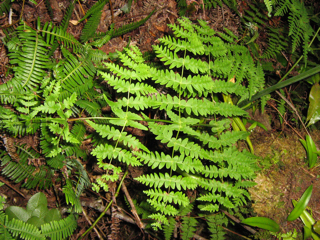 Description: Terrestrial at low elevations, fronds to ca. 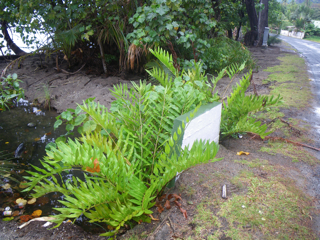 1.5 m, in open, moist, muddy, and/or swampy areas, amongst mangroves, and on coastal cliffs. 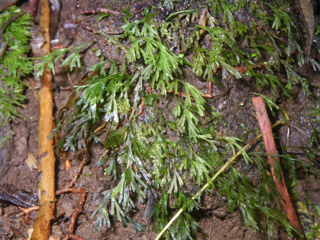 Description: Terrestrial, rarely lithophytic on damp rocks in very shady places in understory, near streams and in moist areas. 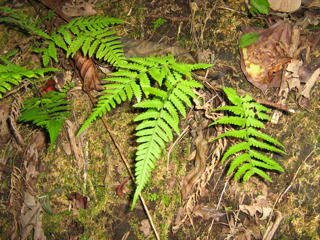 Description: Terrestrial or lithophytic in forest understory. 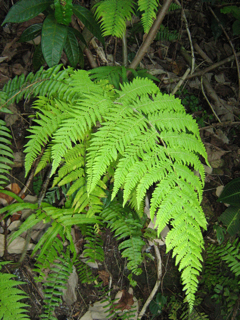 Native to South America, naturalized on Moorea. Description: Terrestrial at middle to high elevations, in exposed, dry to moist areas. 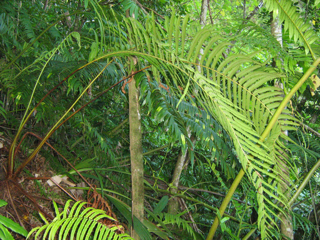 Native to Mexico and Central America, naturalized on Moorea. 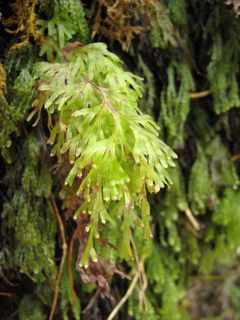 Description: Epiphytic or lithophytic, in damp areas, usually under significant tree cover. 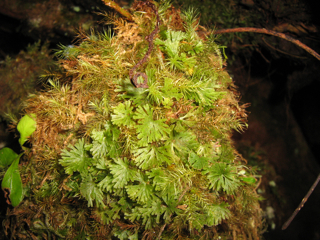 Description: Epiphytic or lithophytic, in damp areas, usually under significant tree cover. 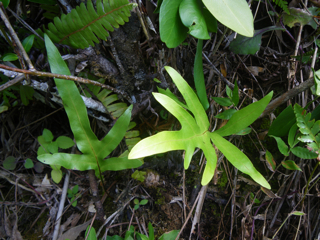 Can resemble a larger version of Antrophyum plantagineum. 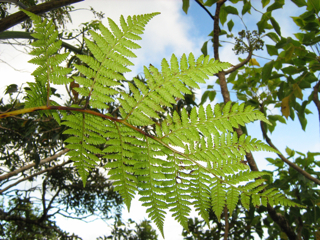 Notes: There are many reports of A. callifolium (type from Java) from the Society Islands, but collections identified as this in herbaria are all referable to A. reticulatum (type from Tahiti), the older name. 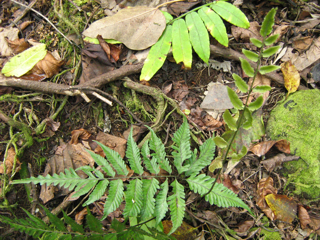 In any case, A. callifolium is dubiously distinct. Description: Lithophytic on dry exposed hillsides. 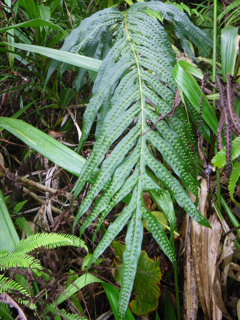 Notes: Material from the Society Islands has historically been called C. tenuifolia; C. nudiuscula is closely related and may differ in density of laminar hairs. Available Mo�orean material was immature and depauperate; additional research is needed to determine which name should be applied. Description: Lithophytic, uncommon on Moorea. 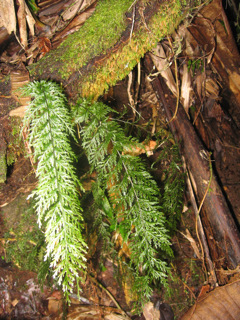 Description: Epiphytic or lithophytic; grass-like fern, mostly on roots of other larger epiphytes, on fallen logs, or on rocks. Description: Terrestrial at low to middle elevations, in rocky disturbed areas, forest margins, plantations. 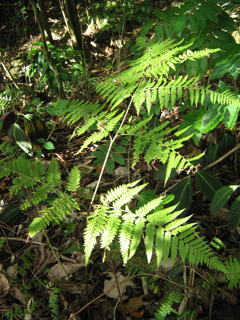 Native to the Neotropics. 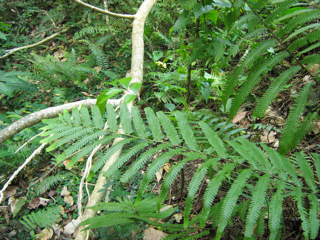 Description: Terrestrial, fronds to 1 meter, in shaded rainforests near streams, in rocky soils. Description: Terrestrial at low elevations in disturbed areas. 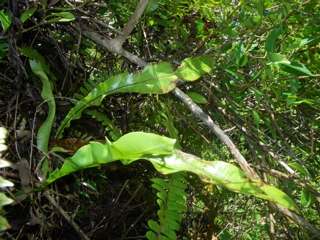 Notes: Ornamental cultivar which has escaped and become naturalized on Moorea. Description: Terrestrial at high elevations. Rare on Moorea. 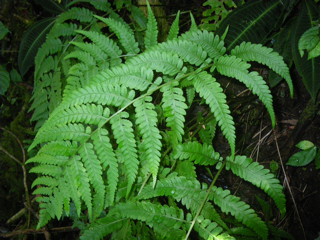 Description: Terrestrial, fronds to 1 meter, in rainforests near streams. Description: Terrestrial at middle to high elevations, in varying habitats, wet to dry, in forests and in open areas, uncommon. Description: Lithophytic, rocks in or near streams. 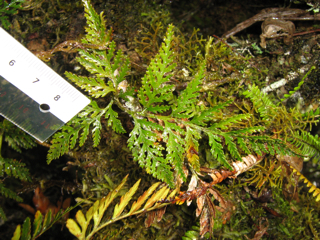 Notes: Family affiliations based on morphology uncertain, but molecular data supports Arthropteris as an early-diverging lineage of Tectariaceae. 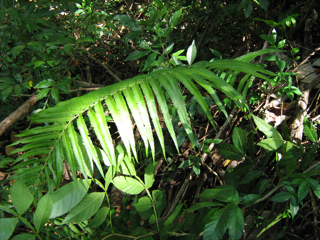 Description: Terrestrial at low elevations, rainforest understory. Description: Terrestrial on ridgetops at high elevation, in cloud forest. Notes: Cannot be assigned to a known species from the Society Islands. 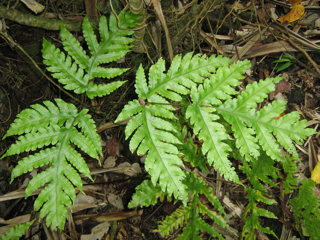 Seems close to Coryphopteris pubirachis var. tahitensis, but additional study needed. Description: Terrestrial in open areas. 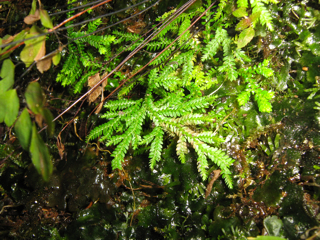 Description: Terrestrial or lithophytic in forest understory. Notes: Cannot be assigned to a known species from the Society Islands. 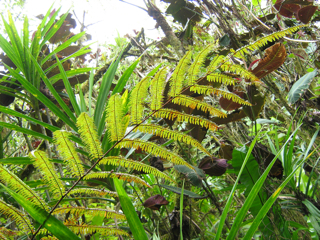 Seems to be close to material of Plesioneuron marquesicum from the Marquesas, but further study needed. 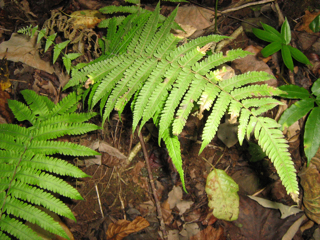 Description: Terrestrial in forest understory at low elevation. Murdock, A. G. and A. R. Smith. 2003. 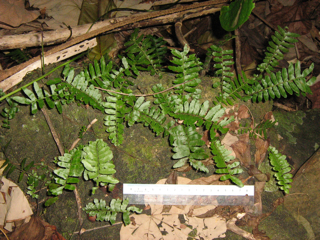 Pteridophytes of Moorea, French Polynesia, with a new species Tmesipteris gracilis. Pacific Science 57(3): 253-265. Nitta, J.H. 2008. 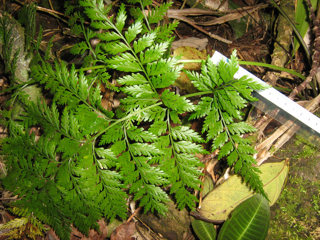 Exploring the utility of three plastid loci for biocoding the filmy ferns (Hymenophyllaceae) of Moorea. Taxon 57(3): 725–736. Nitta, J.H., Meyer, J.-Y., and A.R. Smith. 2011. 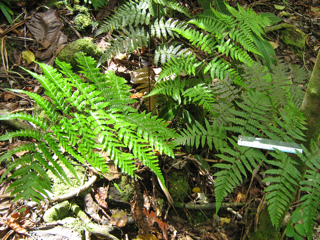 Pteridophytes of Mo'orea, French Polynesia: Additional New Records. 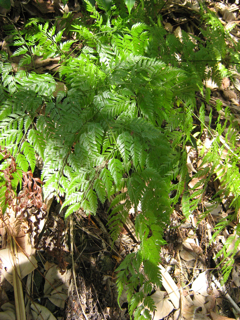 American Fern Journal 101(1): 36–49. Ranker, T. A., Trapp, P. G., Smith, A. R., Moran, R. C., and B. S. Parris. 2005. 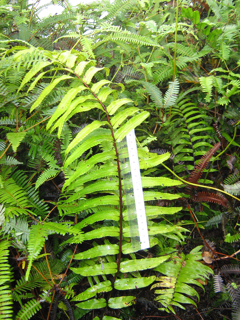 New Records of Lycophytes and Ferns from Moorea, French Polynesia. 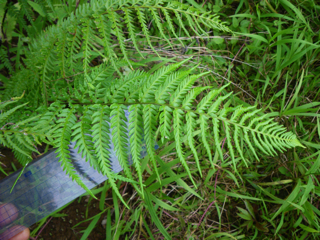 American Fern Journal 95(3): 126–127. Rouhan, G., Lorence, D.H., Motley, T.J., Hanks, J.G., and R.C. Moran. 2008. 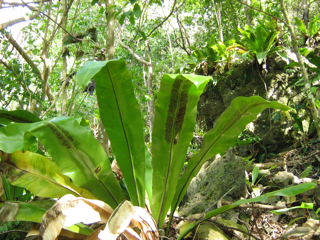 Systematic revision of Elaphoglossum (Dryopteridaceae) in French Polynesia, with the description of three new species. 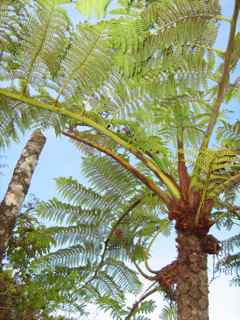 Botanical Journal of the Linnean Society 158(2): 309–331. 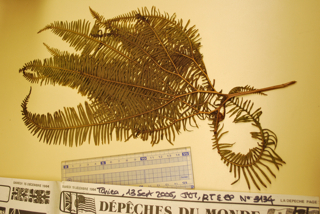 * Unless otherwise noted, all photos of live plants on this page by Joel Nitta (2006, 2008, 2010) and all herbarium specimens by Andy Murdock (2002).